Disney Vans collection! Need them all! Frozen Fever tumbler, just amazing! I have Frozen sisters and Olaf and Sven tumblers and they're soo good! I love This wishlist! I have the castle necklace and the Cinderella doll. I need those coasters! I've had my eye on the Disney Vans since they were announced.. I honestly cannnot wait for them to go on sale! I adore all things disney!! I have the beauty and the beast version of the figurine and it's so beautiful! Also, winnie the pooh vans yes please! I am currently in the process of planning a trip to Disney for Christmas this year with my sister and niece. 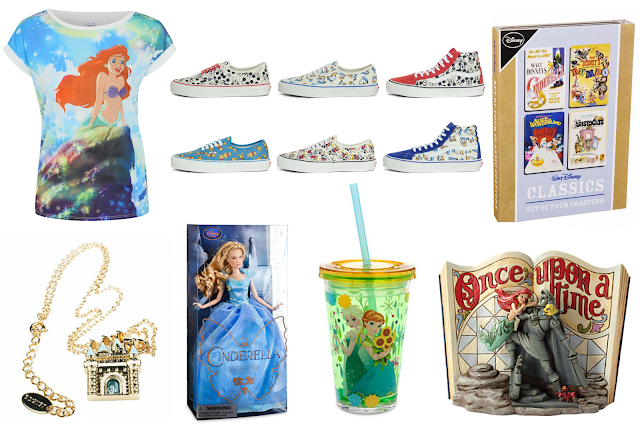 And I already have Disney shopping on the brain! LOVE the Ariel shirt!!! I need everything on this wish list. I am in love with the castle necklace, I think I might have to purchase it.